Welcome to the Virginia Society of Ornithology! 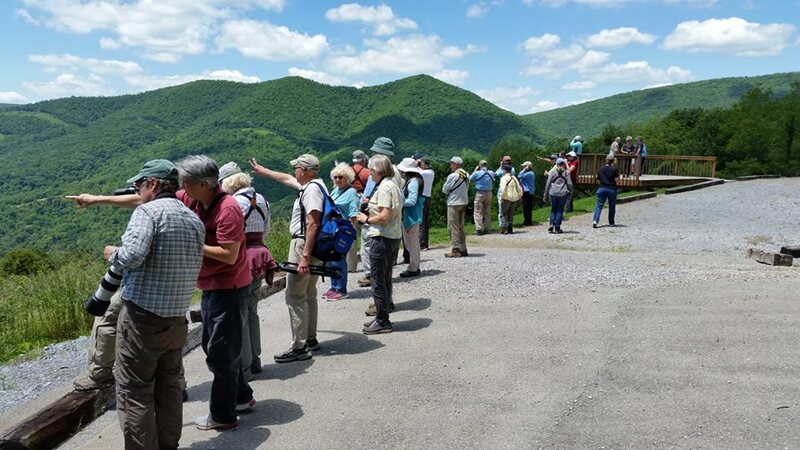 Mother Nature delivered beautiful weather and an abundance of birds for the 55 participants in the VSO's field trip to the New River Valley on June 9-11. Many thanks to Bill Akers and Jerry Via, who led the trips and put in many hours in advance checking out the field trip areas to make sure the birds would make an appearance when we arrived. And appear they did, with 103 species (including 18 warbler species) tallied for the 3 days. 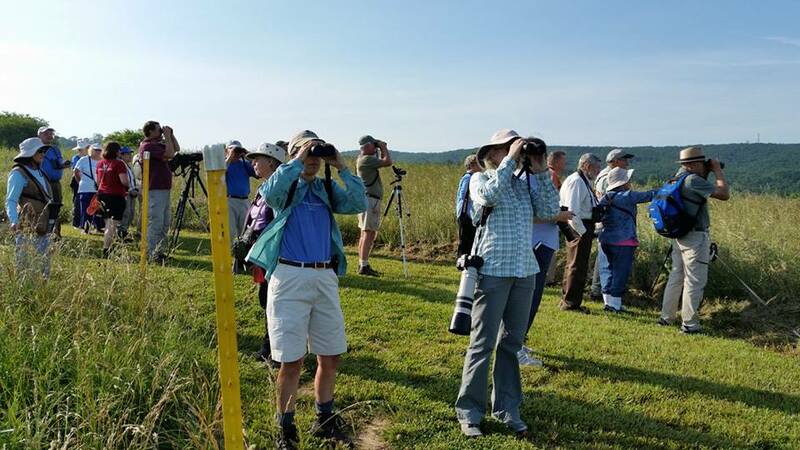 We appreciated the donuts and water they provided for us on Saturday, as well as the assistance from several members of the New River Valley Bird Club: Anna Altizer, John Ford, Hailey Olsen-Hodges, Don Mackler, Bill Opengari, and Pat Polentz. Friday afternoon the entire group traveled to the Biological Station at Mountain Lake and areas around the Lodge. On the way up the mountain on Route 700, we stopped at a magnificent overlook, where we enjoyed scenic views as well as great looks at Chestnut- sided Warbler and Scarlet Tanager. A Red-tailed Hawk glided by, and we had the unique opportunity to observe it from above AND below. Some lucky folks got glimpses of a Golden-winged Warbler. 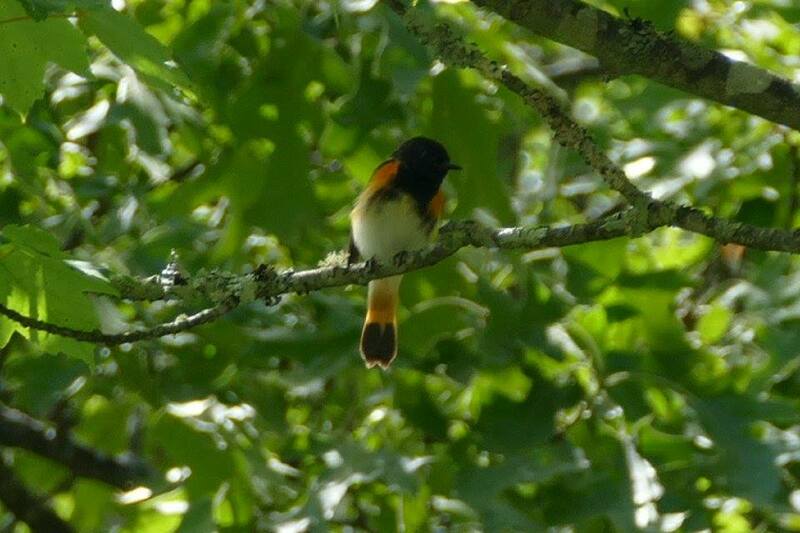 In our walk around the Biological Station, we found Blue-headed Vireo, Blackburnian Warbler, Least Flycatcher, Cedar Waxwing, American Redstart, Rose-breasted Grosbeak and Dark-eyed Junco. 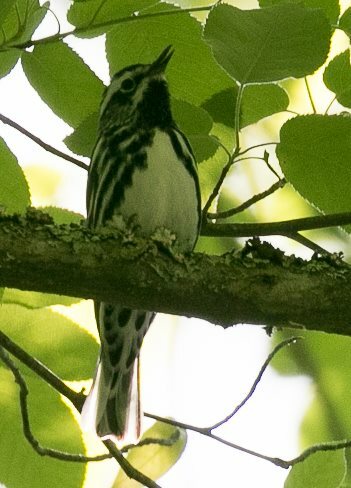 At Mountain Lake we heard a Canada Warbler and Wood Thrush songs and saw Black-throated Blue Warbler, Veery and Hairy Woodpecker. On Saturday we visited Glen Alton and Kelly Flats in Giles County. We divided into three groups and then came back together in the parking lot for lunch. Upon arrival, we heard the vigorous song of a Chestnut-sided Warbler that continued singing throughout the morning. 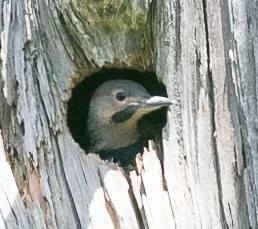 Among the highlights: Blackburnian Warbler, nesting Brown Creeper, Northern Flicker feeding young, Scarlet Tanager, Cedar Waxwing and Baltimore Oriole. At Kelly Flats we found both Hermit Thrush and Wood Thrush. A few observed a Louisiana Waterthrush bathing in a puddle on the side of the road. 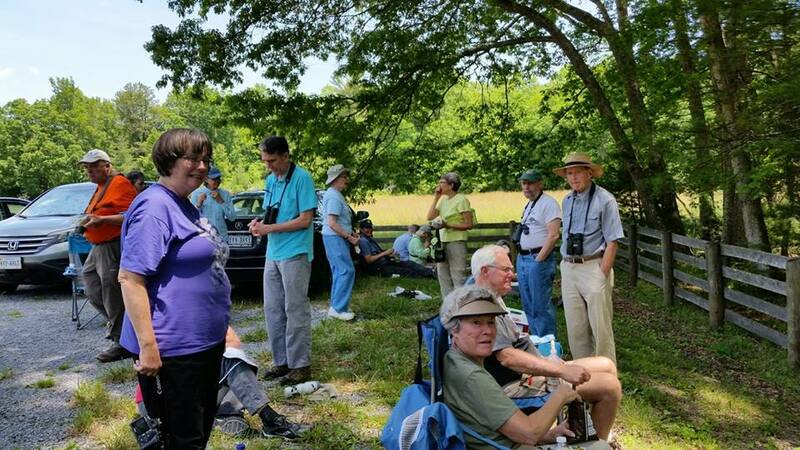 After lunch Bill Opengari led a group to River Bend near Pearisburg to explore a beautiful area along the New River where they added a Double-crested Cormorant to our list. Others accompanied Bill Akers and Jerry Via to a road off Route 460 where Hooded Warbler and Kentucky Warbler were found. On Sunday we visited 2 spots near the host hotel in Blacksburg. 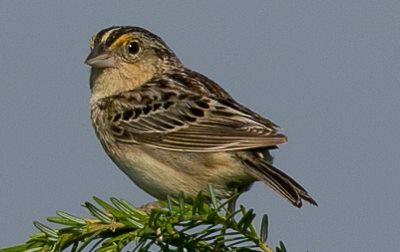 At Blacksburg High School, we scored four species that were previously hard to find in the area: Savannah and Grasshopper Sparrow, Blue Grosbeak, and Willow Flycatcher. 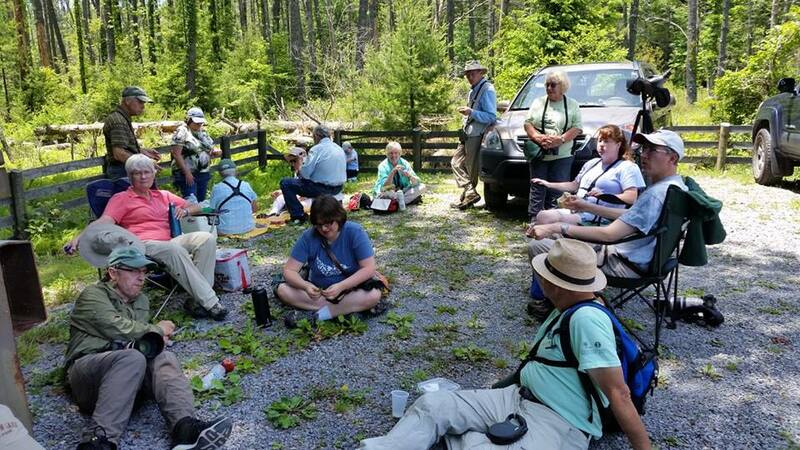 We then traveled to Deerfield Trail just a few miles away and tallied 49 species, including Baltimore Oriole, Orchard Oriole, Yellow Warbler, Worm-eating Warbler, Warbling Vireo, Eastern Kingbird, and a Cedar Waxwing on a nest. Thanks to all who attended and enjoyed this special weekend. The complete list of species seen or heard is shown below.